Ever heard of silence being hilarious? 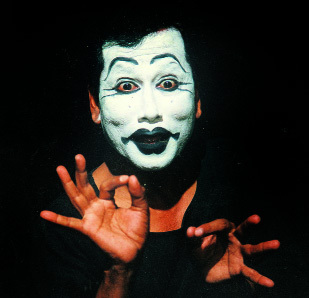 It is possible when one is talking of Moinul Haque, a pioneer in mime in the North-East. Even without uttering a word he is capable of making you break into fits of laughter. He is a storyteller with a difference. He uses his facial expressions and gestures to tell a tale. Familiarity with his mother tongue or native culture is not necessary to understand him. A few flourishes of his hands and a change of expression and you have him portraying a different character---Moinul the child, Moinul the boxing champion or Moinul the glutton. Each act is guaranteed to drive away your blues. Moinul is responsible for reviving mime in the North-East and popularising it among the youth. What makes his performances a pleasurable experience is that he goes into the minutest details. "I tell stories from my own life, especially the childhood spent in my village so that the audience can easily identify with them," says Moinul, a shy and down- to-earth person when offstage. Interestingly, Moinul did not even know the exact meaning of the word 'mime' till he took part in an All-India Mime Festival in Kolkata way back in 1988. For him, it was a gradual progression from mono-acting to proper mime. "People would tell me that they enjoyed the mime part of my performance. Then, I did not know what mime was so I read up Mukabhinay - Tatta and Bidhi by Shyam Mohan Chakravarty, one of the leading mime artistes in Kolkata. But the first time I saw a mime performance was when I was invited to take part in the Kolkata festival," reminisces Moinul. Once his work began being appreciated, there was no looking back. "I started practising for 18 hours everyday, which was very exhausting. During this period, I developed a massive squint which had to be removed through surgery," he says. Though his dedication paid off at a personal level, it did not do much for mime as an art. "Mime is not a glamorous profession and if you count the sweat and toil that go into it, it is not at all difficult to understand why youngsters are reluctant to take it up as a profession," he says. To rectify this situation, Moinul has started his own Mime Academy in Guwahati. "I started the academy to give direction to young talent and popularize this art form through group shows," he adds.